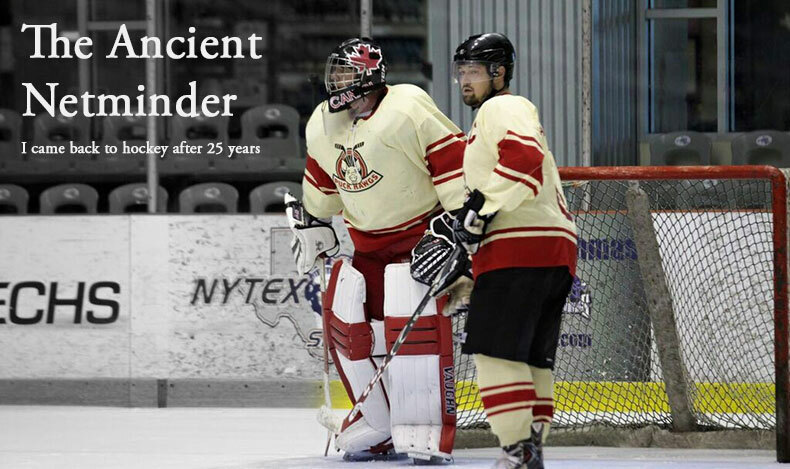 That's my buddy Zach on the left, standing next to me after a recent 'B' division game. 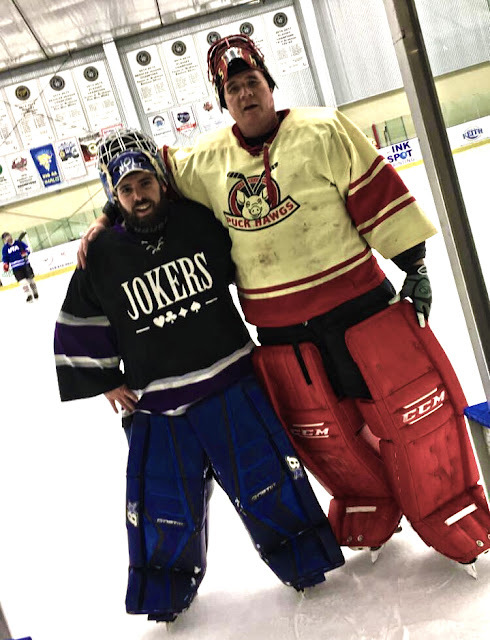 He filled in for a team that didn't have a goalie for the game– a common occurrence that keeps goalies on the ice up to 7 nights a week if you want. If you asked him, he'd tell you he's a solid 'D' division goaltender with aspirations to play full-time in 'C'. He'd tell you he's no 'B' goalie and has no business playing at that level. In this game he was an imposter. When I came back to play net I struggled to relearn the position. Butterfly wasn't something in my vocabulary and my first few seasons were mired in beginner divisions. I struggled mightily and so did my teams. A little time passed and I started relearning the fundamentals, invested in modern equipment and was able to sub for a few teams in 'D' and eventually 'C'. Each time I played a game in a higher division I felt like an imposter. I had no business playing net in games where skaters could control the puck, shoot harder and faster and knew their own positions. Today I mostly play in upper divisions including a state tournament in the 'A' division (a tale for another day) and playing with my regular teams I don't feel like an imposter anymore. That's because I have a team of guys who support me on and off the ice and they have come to trust me to be at least as good as a bale of hay in the crease on any given night. I wouldn't be playing upper divisions without leaping into sub games and often failing. Each time I learned new things about the position and what it took to play. Eventually I stuck and now I get sub game offers from lots of upper teams. Beer league goalies probably worry too much about letting teams down. I know I do. But most nights a team is just grateful they aren't skating 6 with nobody in net and so each of us should grab every opportunity to stretch our skills and find new limits. Be an imposter until you aren't. How did Zach do in his first 'B' game? I was proud of my friend for taking the leap and he played a great game. I hope to see him in the opposing net again soon.